THE LABOUR PARTY will officially campaign in favour of abolition of the Seanad but has acknowledged that it is likely to face significant opposition from within its own ranks for to scrapping the chamber. 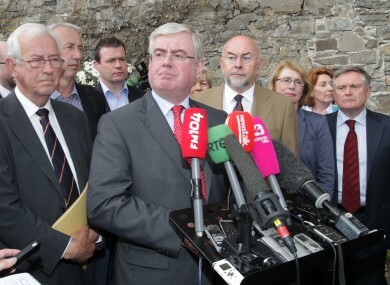 The party’s chief whip in the Dáil, Emmet Stagg, has claimed that there is a 50-50 split within the Labour parliamentary party between those in favour of abolition and those in favour of retention of the Seanad. The spokesperson also acknowledged that the party is a “broad church” and said that “people will be entitled to their opinion on it”. However it is likely that many of those within in Labour who favour keeping the Seanad – against government policy – will not openly campaign for saving the upper house. He said that his personal view “really doesn’t matter” but acknowledged there are differences among TDs and senators about keeping the upper house. All 11 Labour senators have already told the Irish Times they will be voting No in the referendum on 4 October and several TDs have publicly said they are opposed to abolition. “Everyone has voted in favour of putting this to the electorate, so it will be up to people to decide,” the Labour spokesperson added. Of the four main parties only Fine Gael has so far launched its campaign for a Yes vote with Richard Bruton giving several interviews as its director of elections. Labour will not launch its campaign until the second week of September. Fianna Fáil – which will campaign for a No vote – plans to launch its campaign in the days prior to the Dáil returning on 18 September while Sinn Féin – which will campaign for a Yes vote – intends to launch its campaign on 2 September with Pearse Doherty fronting it. Email “'Half of Labour's TDs and senators' are against abolition of the Seanad ”. Feedback on “'Half of Labour's TDs and senators' are against abolition of the Seanad ”.